The skull held aloft by actor David Tennant in the Royal Shakespeare Company's Hamlet was a real one, it has been revealed. Pianist Andre Tchaikowsky left his skull to the RSC when he died in 1982 in the hope it would be used on stage. But since his death at the age of 46, it had only been used in rehearsals. Tennant held it on stage during the famous "Alas, poor Yorick" scene in 22 performances at the Courtyard Theatre, in Stratford-upon-Avon. The Doctor Who star has been lauded for his performance as Hamlet since it opened in Shakespeare's home town in August. But it was not revealed that Tennant used a real skull in the play's most famous scene. Mr Tchaikowsky, an acclaimed composer and concert pianist, died of cancer in 1982 aged 46 and donated his body for medical science. In his will he wrote that his skull "shall be offered by the institution receiving my body to the Royal Shakespeare Company for use in theatrical performance". Since then it has only been used in rehearsals because no actor felt comfortable enough using it on stage in front of an audience. In 1989 actor Mark Rylance rehearsed with it for a while, but in the end it was decided using the skull for performances would not be appropriate. Instead, Rylance used a cast of Mr Tchaikowsky's skull, and the real thing was returned to the props department, where it resided in a tissue-lined box for almost 20 years. It remained there until Greg Doran, who directed Tennant in Hamlet, retrieved it for his production. "It was sort of a little shock tactic. Though, of course, to some extent that wears off and it's just André, in his box," Doran told the Daily Telegraph. He added that he did not want the story to get out before Hamlet opened. 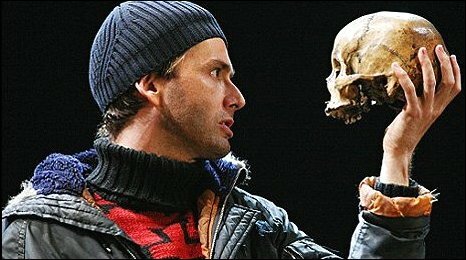 He said: "I thought it would topple the play and it would be all about David acting with a real skull." It is thought the skull will also be used when Hamlet transfers to London on 9 December. RSC curator David Howells: "We hope Mr Tchaikowsky would have been pleased that his final wish has been realised in Gregory Doran's acclaimed production of Hamlet."